Cranbrook Art Museum (top left) in Bloomfield Hills and The Henry Ford (top center) in Dearborn are National Historic Landmarks. The Detroit metropolitan area, often referred to as Metro Detroit, is a major metropolitan area located in Southeast Michigan, consisting of the city of Detroit and its surrounding area. There are several definitions of the area, including the official statistical areas designated by the Office of Management and Budget, a federal agency of the United States. Metro Detroit is known for its automotive heritage, arts, entertainment, popular music, and sports. The area includes a variety of natural landscapes, parks, and beaches, with a recreational coastline linking the Great Lakes. It is one of the nation's largest metropolitan economies, with seventeen Fortune 500 companies. The Detroit Urban Area, which serves as the core of the metropolitan area, ranks as the 11th most populous in the United States, with a population of 3,734,090 as of the 2010 census and an area of 1,337.16 square miles (3,463.2 km2). This urbanized area covers parts of the counties of Macomb, Oakland, and Wayne. These counties are sometimes referred to as the Detroit Tri-County Area and had a population of 3,862,888 as of the 2010 census with an area of 1,967.1 square miles (5,095 km2). The Office of Management and Budget (OMB), a federal agency of the United States, defines the Detroit–Warren–Livonia Metropolitan Statistical Area (MSA) as the six counties of Lapeer, Livingston, Macomb, Oakland, St. Clair, and Wayne. As of the 2010 census, the MSA had a population of 4,296,250 with an area of 3,913 square miles (10,130 km2). 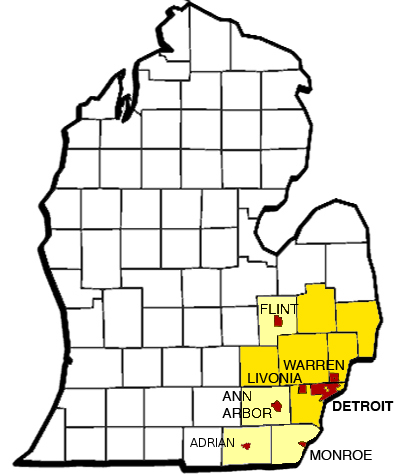 The nine county area designated by the OMB as the Detroit–Ann Arbor–Flint Combined Statistical Area (CSA) includes the Detroit–Warren–Livonia MSA and the three additional counties of Genesee, Monroe, and Washtenaw (which include the metropolitan areas of Flint, Monroe, and Ann Arbor, respectively). It had a population of 5,318,744 as of the 2010 census and covers an area of 5,814 square miles (15,060 km2). Lenawee County was removed from the CSA in 2000, but added back in 2013. With the adjacent city of Windsor, Ontario and its suburbs, the combined Detroit–Windsor area has a population of about 5.7 million. When the nearby Toledo metropolitan area and its commuters are taken into account, the region constitutes a much larger population center. An estimated 46 million people live within a 300-mile (480 km) radius of Detroit proper. Metro Detroit is at the center of an emerging Great Lakes Megalopolis. Conan Smith, a businessperson quoted in a 2012 article by The Ann Arbor News, stated the most significant reason Washtenaw County, including Ann Arbor, is not often included in definitions of Metro Detroit is that there is a "lack of affinity that Washtenaw County as a whole has with Wayne County and Detroit or Oakland County and Macomb" and that residents of the county "just don't yet see ourselves as a natural part of that region, so I think it feels a little forced to a lot of people, and they're scared about it." One Detroit Center overlooks the city's financial district. Detroit and the surrounding region constitute a major center of commerce and global trade, most notably as home to America's 'Big Three' automobile companies: General Motors, Ford, and Chrysler. Detroit's six-county Metropolitan Statistical Area (MSA) has a population of about 4.3 million and a workforce of about 2.1 million. In May 2012, the Department of Labor reported metropolitan Detroit's unemployment rate at 9.9%. The Detroit MSA had a Gross Metropolitan Product (GMP) of $197.7 billion in 2010. Firms in the region pursue emerging technologies including biotechnology, nanotechnology, information technology, and hydrogen fuel cell development. Metro Detroit is one of the leading health care economies in the U.S., according to a 2003 study measuring health care industry components, with the region's hospital sector ranked fourth in the nation. Casino gaming plays an important economic role, with Detroit the largest US city to offer casino resort hotels. Caesars Windsor, Canada's largest, complements the MGM Grand Detroit, MotorCity Casino, and Greektown Casino in the city. The casino hotels contribute significant tax revenue along with thousands of jobs for residents. Gaming revenues have grown steadily, with Detroit ranked as the fifth largest gambling market in the United States for 2007. When Casino Windsor is included, Detroit's gambling market ranks either third or fourth. There are about four thousand factories in the area. The domestic auto industry is primarily headquartered in Metro Detroit. The area is also an important source of engineering job opportunities. A 2004 Border Transportation Partnership study showed that 150,000 jobs in the Detroit–Windsor region and $13 billion in annual production depend on the city's international border crossing. A rise in automated manufacturing using robotic technology has created related industries in the area. In addition to property taxes, residents pay an income tax rate of 2.50%. Detroit automakers and local manufacturers have made significant restructurings in response to market competition. GM made its initial public offering (IPO) of stock in 2010, after bankruptcy, bailout, and restructuring by the federal government. Domestic automakers reported significant profits in 2010, interpreted by some analysts as indicating the beginning of an industry rebound and an economic recovery for the Detroit area. The region's nine county area with its population of 5.3 million has a workforce of about 2.6 million with about 247,000 businesses. Fourteen Fortune 500 companies are based in metropolitan Detroit. In April 2015, the metropolitan Detroit unemployment rate was 5.1 percent, a rate lower than the New York, Los Angeles, Chicago and Atlanta metropolitan areas. Metro Detroit has made Michigan's economy a leader in information technology, biotechnology, and advanced manufacturing; Michigan ranks fourth nationally in high tech employment with 568,000 high tech workers, including 70,000 in the automotive industry. Michigan typically ranks second or third in overall Research & development (R&D) expenditures in the United States. Metro Detroit is an important source of engineering and high tech job opportunities. As the home of the "Big Three" American automakers (General Motors, Ford, and Chrysler), it is the world's traditional automotive center and a key pillar of the U.S. economy. In the 2010s, the domestic auto industry accounts, directly and indirectly, for one of ten jobs in the United States making it a significant component for economic recovery. For 2010, the domestic automakers have reported significant profits indicating the beginning of rebound. A Center for Automotive Research (CAR) study estimated that tax revenue generated by the automotive industry in the United States for a single year, 2010, amounted to $91.5 billion in state and local tax revenue and additional $43 billion in federal tax revenue. Metro Detroit serves as the headquarters for the United States Army TACOM Life Cycle Management Command (TACOM), with Selfridge Air National Guard Base. 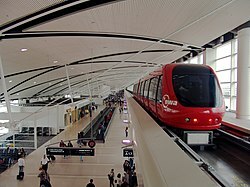 Detroit Metropolitan Airport (DTW) is one of America's largest and most recently modernized facilities, with six major runways, Boeing 747 maintenance facilities, and an attached Westin Hotel and Conference Center. Detroit is a major U.S. port with an extensive toll-free expressway system. A 2004 Border Transportation Partnership study showed that 150,000 jobs in the Detroit-Windsor region and $13 billion in annual production depend on Detroit's international border crossing. A source of top talent, the University of Michigan in Ann Arbor is one of the world's leading research institutions, and Wayne State University in Detroit has the largest single-campus medical school in the United States. Metro Detroit is a prominent business center, with major commercial districts such as the Detroit Financial District and Renaissance Center, the Southfield Town Center, and the historic New Center district with the Fisher Building and Cadillac Place. Among the major companies based in the area, aside from the major automotive companies, are BorgWarner (Auburn Hills), Quicken Loans (Downtown Detroit), TRW Automotive Holdings (Livonia), Ally Financial (Downtown Detroit), Carhartt (Dearborn), and Shinola (Detroit). Compuware, IBM, Google, and Covansys are among the information technology and software companies with a headquarters or major presence in or near Detroit. HP Enterprise Services makes Detroit its regional headquarters, and one of its largest global employment locations. The metropolitan Detroit area has one of the nation's largest office markets with 147,082,003 square feet. Chrysler's largest corporate facility is its U.S. headquarters and technology center in the Detroit suburb of Auburn Hills, while Ford Motor Company is in Dearborn, directly adjacent to Detroit. In the decade leading up to 2006, downtown Detroit gained more than $15 billion in new investment from private and public sectors. Tourism is an important component of the region's culture and economy, comprising nine percent of the area's two million jobs. About 15.9 million people visit metro Detroit annually, spending about $4.8 billion. Detroit is the largest city or metro area in the U.S. to offer casino resort hotels (MGM Grand Detroit, MotorCity Casino, Greektown Casino, and nearby Caesars Windsor). The Detroit Zoo's Arctic Ring of Life. Metro Detroit is a tourist destination easily accommodating super-sized crowds to events such as the Woodward Dream Cruise, North American International Auto Show, the Windsor-Detroit International Freedom Festival, 2009 NCAA Final Four, and Super Bowl XL. The Detroit International Riverfront links the Renaissance Center a series of venues, parks, restaurants, and hotels. In 2006, the four-day Motown Winter Blast drew a cold weather crowd of about 1.2 million people to Campus Martius Park area downtown. Detroit's metroparks include fresh water beaches such as Metropolitan Beach, Kensington Beach, and Stony Creek Beach. Metro Detroit offers canoeing through the Huron-Clinton Metroparks as well as downhill and cross-county skiing at Alpine Valley Ski Resort, Mt. Brighton, Mt. Holly, and Pine Knob Ski Resort. The Detroit River International Wildlife Refuge is the only international wildlife preserve in North America, uniquely located in the heart of a major metropolitan area. The Refuge includes islands, coastal wetlands, marshes, shoals, and waterfront lands along 48 miles (77 km) of the Detroit River and Western Lake Erie shoreline. Metro Detroit contains a number of shopping malls, including the upscale Somerset Collection in Troy, Great Lakes Crossing outlet mall in Auburn Hills, and Twelve Oaks Mall in Novi, all of which are draws for tourists. The region's leading attraction is The Henry Ford, located in the Detroit suburb of Dearborn, which is America's largest indoor-outdoor museum complex. The recent renovation of the Renaissance Center, a state of the art cruise ship dock, new stadiums, and a new RiverWalk have spurred economic development. Nearby Windsor has a 19-year-old drinking age with a myriad of entertainment to complement Detroit's Greektown district. Tourism planners have yet to tap the potential economic impact of the estimated 46 million people that live within a 300-mile (480-km) radius of Detroit. A view of the Detroit International Riverfront from Belle Isle. Metro Detroit is a six-county metropolitan statistical area (MSA) with a population of 4,296,250—making it the 13th-largest MSA in the United States as enumerated by the 2010 United States Census (2010 Census). The Detroit region is a nine-county Combined Statistical Area (CSA) with a population of 5,218,852—making it the 12th-largest CSA in the United States as enumerated by the 2010 Census. The Detroit–Windsor area, a commercial link straddling the Canada-U.S. border, has a total population of about 5,700,000. Immigration and the natural birth rate have not kept pace with the MSA's (nor CSA's) losses from death and emigration since the 2000 United States Census. As of the census of 2010, there were 4,296,250 people, 1,682,111 households, and 1,110,454 families residing within the metropolitan statistical area. The census reported 70.1% White, 22.8% African American, 0.3% Native American, 3.3% Asian, 0.02% Pacific Islander, 1.2% from other races, and 2.2% from two or more races. Hispanic or Latino of any race were 6.2% of the population. Arab Americans were at least 4.7% of the region's population (considered white in the US Census). As of the 2010 American Community Survey estimates, the median income for a household in the MSA was $48,198, and the median income for a family was $62,119. The per capita income for the MSA was $25,403. The region's foreign-born population sat at 8.6%. The region contains the largest concentration of Arab-Americans in the United States, particularly in Dearborn. The metro area also has the 25th largest Jewish population worldwide. In 1701, French officer Antoine de La Mothe Cadillac, along with fifty-one additional French-Canadians, founded a settlement called Fort Ponchartrain du Détroit, naming it after the comte de Pontchartrain, Minister of Marine under Louis XIV. The French legacy can be observed today in the names of many area cities (ex. Detroit, Grosse Pointe, Grosse Ile) and streets (ex. Gratiot, Beaubien, St. Antoine, Cadieux). Later came an influx of persons of British and German descent, followed by Polish, Irish, Italian, Lebanese, Assyrian/Chaldean, Greek, Jewish, and Belgian immigrants who made their way to the area in the early 20th century and during and after World War II. There was a large migration into the city from the rural South following World War I. Today, the Detroit suburbs in Oakland County, Macomb County, and northeastern and northwestern Wayne County are predominantly Caucasian. Oakland County is among the most affluent counties in the United States with populations over one million. In Wayne County, the city of Dearborn has a large concentration of Arab Americans, mainly Lebanese. Recently, the area has witnessed some growth in Albanian, Asian and Hispanic populations. Immigration continues to play a role in the region's projected growth with the population of Detroit-Ann Arbor-Flint (CMSA) estimated to be 6,191,000 by 2025. In the 2000s, 115 of the 185 cities and townships in Metro Detroit were over 95% white. Suburban blacks in Metro Detroit were more concentrated, as 44% of the more than 240,000 suburban blacks lived in Detroit, Highland Park, Inkster, Pontiac, and Southfield. The largest airport in the area is Detroit Metropolitan Wayne County Airport (DTW) in Romulus, an international airport that serves as a commercial hub for Delta Air Lines and Spirit Airlines. St. Clair County International Airport (near Port Huron, Michigan) - An international airport on the Canada–US border. Bus service for the metropolitan area is provided jointly by the Detroit Department of Transportation (DDOT) and Suburban Mobility Authority for Regional Transportation (SMART) which operate under a cooperative service and fare agreement. The elevated Detroit People Mover encircles downtown providing service to numerous downtown hotels, offices and attractions. The Woodward Avenue Streetcar is being developed to provide service between downtown and New Center, and the proposed SEMCOG Commuter Rail would extend from Detroit's New Center area to The Henry Ford, Dearborn, Detroit Metropolitan Airport, Ypsilanti, and Ann Arbor The Regional Transit Authority (RTA) was established in December 2012 to coordinate the services of all existing transit providers, and to develop a bus rapid transit service along Woodward Avenue. The Metro Detroit area is linked by an advanced network of major roads and freeways which include Interstate highways. Traditionally, Detroiters refer to some of their freeways by name rather than route number. The Davison, Lodge, and Southfield freeways are almost always referred to by name rather than route number. Detroiters commonly precede freeway names with the word 'the' as in the Lodge, the Southfield, and the Davison. Those without names are referred to by number. Surface street navigation in Metro Detroit is commonly anchored by "mile roads", major east-west surface streets that are spaced at one-mile (1.6 km) intervals and increment as one travels north and away from the city center. Mile roads sometimes have two names, the numeric name (ex. 15 Mile Road) used in Macomb County and a local name (ex. Maple Road) used in Oakland County mostly. Professional sports has a major fan following in Metro Detroit. The area is home to many sports teams, including six professional teams in four major sports. The area's several universities field teams in a variety of sports. Michigan Stadium, home of the Michigan Wolverines, is the largest American football stadium in the world. Metro Detroit hosts many annual sporting events including auto and hydroplane racing. The area has hosted many major sporting events, including the 1994 FIFA World Cup, Super Bowl XVI, Super Bowl XL, Wrestlemania 23, the 2005 Major League Baseball All-Star Game, many Stanley Cup Championship rounds, the first two games of the 2006 World Series, and the last two games of the 2012 World Series. The Michigan International Speedway in Brooklyn hosts various Auto racing: NASCAR, IRL, and ARCA. The Detroit River hosts Hydroplane racing held by the APBA for the Detroit APBA Gold Cup. Metro Detroit is served by nine telephone area codes (six not including Windsor). The 313 area code, which used to encompass all of Southeast Michigan, is today confined exclusively to the City of Detroit and several neighboring Wayne County suburbs. The 248 area code along with the newer 947 area code overlay mostly serve Oakland County. Macomb County is largely served by 586. Genesee, St. Clair, and Lapeer counties, eastern Livingston County, and part of northern Oakland County are covered by 810. Washtenaw, Monroe, and most of the Wayne County suburbs are in the 734 area. The Windsor area (and most of southwestern Ontario) is served by an overlay complex of three codes—519, 226, and 548. ^ "Revised Delineations of Metropolitan Statistical Areas, Micropolitan Statistical Areas, and Combined Statistical Areas, and Guidance on Uses of the Delineations of These Areas". OMB BULLETIN NO. 13-01. Executive Office of the President, Office of Management and Budget. http://www.whitehouse.gov/sites/default/files/omb/bulletins/2013/b13-01.pdf. Retrieved 4 April 2014. ^ Statistics Canada . Retrieved on August 2, 2016. ^ a b Cities located close to Detroit.Time and Date world clock distances. Retrieved on September 2, 2007. ^ Stanton, Ryan J. "Conan Smith: Why Ann Arbor doesn't see itself as part of Metro Detroit - and why it should." The Ann Arbor News. Wednesday May 30, 2012. Retrieved on November 9, 2013. ^ Michigan Department of Labor and Economic Growth. Retrieved June 14, 2012. ^ "Detroit, MI Unemployment Rate". Ycharts.com. http://ycharts.com/indicators/detroit_mi_unemployment_rate. Retrieved July 21, 2014. ^ Bureau of Labor Statistics (5/2011). Civilian labor force and unemployment by state and metropolitan area. U.S. Department of Labor. ^ "Gross Metropolitan Product". Greyhill Advisors. http://greyhill.com/gross-metropolitan-product. Retrieved September 30, 2011. ^ Devol, Ross C. and Rob Koepp (August 2003).America's Health Care Economy.Miliken Institute. Retrieved on November 6, 2011. Archived February 7, 2012 at the Wayback Machine. ^ a b Mink, Randy, and Karen Mink (July 2001).Detroit Turns 300 - Detroit 300 Festival. Travel America, World Publishing Co., Gale Group. ^ World Book Inc., Volume 5. 2008. ^ Automation Alley Technology Industry Report (2011 Edition).Anderson Economic Group. Retrieved August 14, 2011. Archived July 5, 2015 at the Wayback Machine. ^ Detroit Regional Chamber (2006) Detroit/Windsor Border Update: Part I-Detroit River International Crossing Study at the Wayback Machine (archived May 6, 2008). Retrieved on April 8, 2007. ^ Walsh, Tom (August 29, 2009).FIRST Robotics Detroit Regional Competition. Detroit Free Press. ^ Army to create jobs in Warren expansion.Detroit Free Press. ^ "FAQS – City of Detroit | www.detroitmi.gov". http://www.detroitmi.gov/DepartmentsandAgencies/Finance/IncomeTaxDivision/FAQs/tabid/1654/Default.aspx. Retrieved May 3, 2010. ^ Baldwin, Clare, and Soyoung Kim (November 17, 2010). GM IPO raises $20.1 billion.Reuters. Retrieved on February 11, 2013. ^ a b Schroeder, Robert (July 30, 2010).Obama says U.S. auto industry on rebound. Wall Street Journal. Retrieved on September 9, 2010. ^ a b GM posts profit, CEO Whitacre to retire.CNN Money. Retrieved on September 18, 2010. ^ Oosting, Jonathan (December 1, 2010). Brookings: Metro Detroit economy on 'road to full recovery'.Mlive. Retrieved July 17, 2011. ^ Regional Profile Detroit Regional Chamber. Retrieved on June 17, 2009. ^ Mlive.com. Fortune 500: GM, Ford, Dow among top Michigan companies for 2014. Retrieved February 7, 2015. ^ Bureau of Labor Statistics. Unemployment rates for metropolitan areas. U.S. Department of Labor. Retrieved February 7, 2015. ^ MEDC (2009).Michigan: High Technology Focus State of Michigan. Retrieved on June 17, 2009. ^ Metro Detroit, Michigan score high in biotech VC rankings. Metromode 12-17-2009. Retrieved on July 14, 2010. ^ MEDC,(2009).Michigan Advantage State of Michigan. Retrieved on June 17, 2009. ^ Mark Arend (January 2012).Where the high tech jobs are. Site Selection magazine. ^ "Michigan Cities". Encyclopædia Britannica Online. http://student.britannica.com/comptons/article-204598/Michigan. Retrieved December 26, 2008. "[Detroit] is the automobile capital of the world"
^ "SAE World Congress convenes in Detroit". http://www.sae.org/congress/. Retrieved December 26, 2008. ^ Lawrence, Peter (2009).Interview with Michigan's Governor, Corporate Design Foundation. Retrieved on May 2, 2009. "Michigan is known as the world's automotive center." ^ Shoenberger, Robert (May 25, 2010).Rebounding auto industry boosts Shiloh Industries' second-quarter sales, profit. Cleveland.com. Retrieved on September 18, 2010. ^ Cwiek, Sarah (November 30, 2010).New study shows strong economic recovery in Metro Detroit. NPR Michigan. Retrieved December 4, 2010. ^ Eisenstein, Paul A. (April 2012). "Assessment of tax revenue generated by the auto industry". Center for Automotive research. http://www.cargroup.org/assets/files/final_tax_revenues_apr_2012_v3.pdf. Retrieved December 2, 2012. ^ Why MITA will be a success.Michigan International Trade Association. Retrieved on September 3, 2007. "Detroit is the most active commercial port of entry in the USA." "Greater Detroit is the number one exporting region among 310 defined metropolitan areas (CMSA) in the U.S."
^ Regional Advantages for International Business. World Trade Center Detroit Windsor. Retrieved on September 3, 2007. ^ Why doesn't Michigan have toll roads?.Michigan Department of Transportation. Retrieved on September 5, 2007. "A system of toll free highways has been viewed as important to commerce, industry, tourism, and general economic development." ^ "Annual Report on Research, Scholarship and Creative Activity at the University of Michigan FY2006" (PDF). UM Research. January 18, 2007. Archived from the original on 2007-09-25. https://web.archive.org/web/20070925204956/http://www.research.umich.edu/research_guide/annual_reports/FY06/FY06ResearchExpenditures.pdf. Retrieved 2007-11-14. ^ Grad profiles. Wayne State. Retrieved on October 27, 2008. ^ The Urban Markets Initiative, Brookings Institution Metropolitan Policy Program The Social Compact, Inc. University of Michigan Graduate Real Estate Program (October 2006).Downtown Detroit In Focus: A Profile of Market Opportunity. Downtown Detroit Partnership. Retrieved on July 14, 2010. ^ "Detroit: Economy Major Industries and Commercial Activity". Advameg, Inc.. http://www.city-data.com/us-cities/The-Midwest/Detroit-Economy.html. Retrieved 2008-06-12. ^ Fifth Third Bank rocks the Winter Blast.Michigan Chronicle. (March 14, 2006). ^ Audi, Tamara (September 26, 2007). What Happens In Detroit. The Wall Street Journal, B6. "But the market at issue, as MGM Mirage sees it, includes a 300-mile radius of potential overnight clients across the region,"
^ "Annual Estimates of the Population of Metropolitan and Micropolitan Statistical Areas: April 1, 2000 to July 1, 2007". US Census Bureau. http://www.census.gov/population/www/estimates/CBSA-est2007-annual.html. Retrieved September 9, 2008. ^ World Agglomerations Retrieved on May 5, 2009. ^ "Metro Area Factsheet: Detroit-Ann Arbor-Flint, Michigan CMSA". Federation for Immigration Reform. Archived from the original on June 11, 2010. https://web.archive.org/web/20100611202643/http://www.fairus.org/site/PageNavigator/facts/local_data_mi_detroit_ann. Retrieved February 10, 2013. ^ a b Baulch, Vivian M. (September 4, 1999). Michigan's greatest treasure -- Its people. Michigan History, The Detroit News. Retrieved on April 4, 2009. ^ "2004–05 Community profile Oakland County". Archived from the original on 9 July 2007. https://web.archive.org/web/20070709220902/http://www.oakgov.com/peds/assets/docs/community_profiles/OakCounty.pdf#search=%22Oakland%20County%20richest%22. Retrieved 11 July 2007. "Oakland County also ranks as the fourth wealthiest county in the nation among counties with populations of more than one million people." ^ Metro Area Factsheet: Detroit-Ann Arbor-Flint, Michigan CMSA.Federation for Immigration Reform. Retrieved on April 12, 2011. ^ Towbridge, Gordon. "Racial divide widest in US." The Detroit News. January 14, 2002. Retrieved on March 30, 2009. ^ Ann Arbor - Detroit Regional Rail Project SEMCOG. Retrieved on February 4, 2010. Wikivoyage has a travel guide for Metro Detroit. "Historic Light Station Information and Photography: Michigan". United States Coast Guard Historian's Office. http://www.uscg.mil/history/weblighthouses/LHMI.asp. Map of Michigan Lighthouse in PDF Format. This page uses content from the English language Wikipedia. The original content was at Metro Detroit. The list of authors can be seen in the page history. As with this Familypedia wiki, the content of Wikipedia is available under the Creative Commons License.